Count four (or two) and off at the beginning of the next beat and continue at the slow tempo to the last system, which is a tempo (110). So here are the practices pieces. first page, first full measure, I believe the recording is playing two “d”s on the forth beat and the same in the next system second measure last beat. Fixed that, and a couple of others. 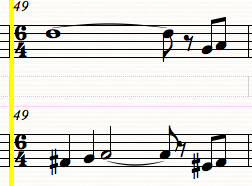 Note also the changes in tempo. Hi! I loved singing this in choir as a kid. Now I’m teaching choir (down in Oregon) and I’d love to share it with my class. I can’t find sheet music for it anywhere though — seems to be out of print. Do you have the sheet music by any chance or know where I could find it? We just performed the piece, singing from hand written, xeroxed sheets, supplied by our conductor, Jerry Wright. He might be able to help you out. His email is on the home page of the website (auditions). 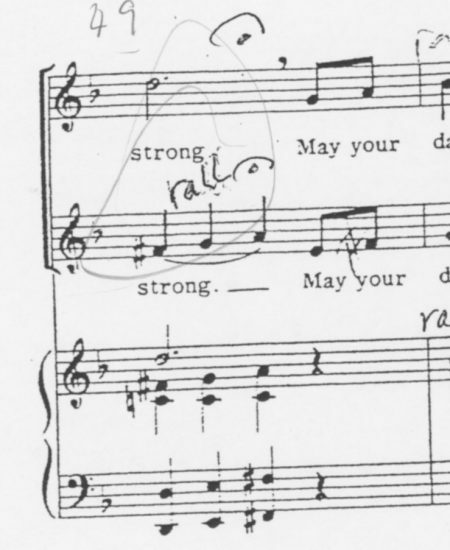 If he says he can send you his hand-written document, and you use music composition software, get back to me. The La-la singer MP3’s were created from an electronic score. We can get together on a compatible format for you. It only has the vocal parts, but that’s a start. Glad to see others using the website!